This Grace Glass Funky twist green from the Hammer series is a Straight Bong in Double Chamber. With an eighyt of 38cm and triple green shades coloration and high detailed decorations on the exterior glass. This heavy hitter glass water pipe includes three ice pinches,spyral graceglass diffused perc and removable multi-slit downstem with compatible 18mm thick walled funnel bowl and arubber covered kickhole. 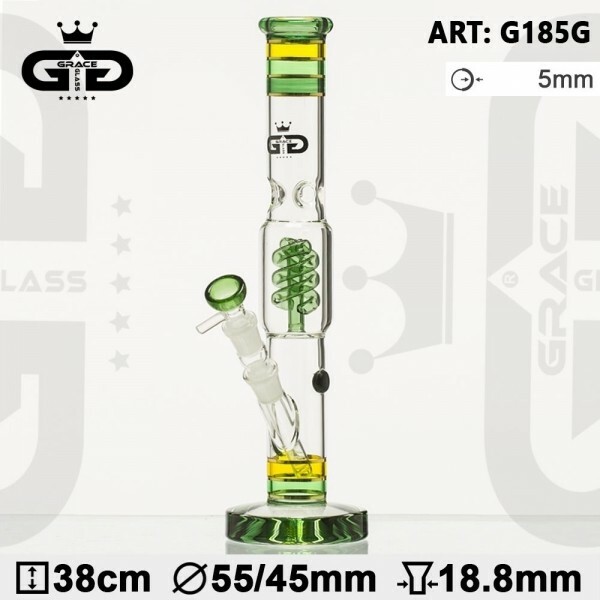 This scientific straight tube bong securely stands on super thick flared foot base made from quality borosilicate glass. Shop our wide selection of glass bongs, beakers, bubblers, dab rigs and downstems from Grace Glass.